in my setup >>external<< ADC (AD 7723) is connected via (16-Bit data-bus >> DB0-DB16) to the AVR Device which is ATmega 2560. Each data-bit source has a dedicated port on ATmega. In my understanding I should read through 16 data-lines on AVR dedicated pins and then save all that in a 16 character array. But afterwards which ways exist to convert those array elements into decimal numbers to be able to work with them later on. save all that in a 16 character array. ?? Haven't a clue what you mean here?? Either itoa() or sprintf() will convert the numeric value in the variable to a srting of ASCII digits you can show to the shaved ape. const int clock_signal_port = 10; // ADC clock generation via PWM on Pin-10 1.0KHz; Due pin No 10 is attached to AD7723 CLKIN pin. 1. instrumentation amplifiers do provide the suitable analog voltage at the (V+/ V-) inputs of the ADC, checked with the scope the upper signal 135 Hz. So that's the hole story behind all this trouble of mine. Hope you guys can put some light into this. Please no! This process of reading one bit at a time is painful to look at! Using digitalRead, well known for its slowness, by the time you reach the last bit, the first one probably already has a different reading. You need to figure out what are the actual AVR ports that are connected to the ADC and read them directly. 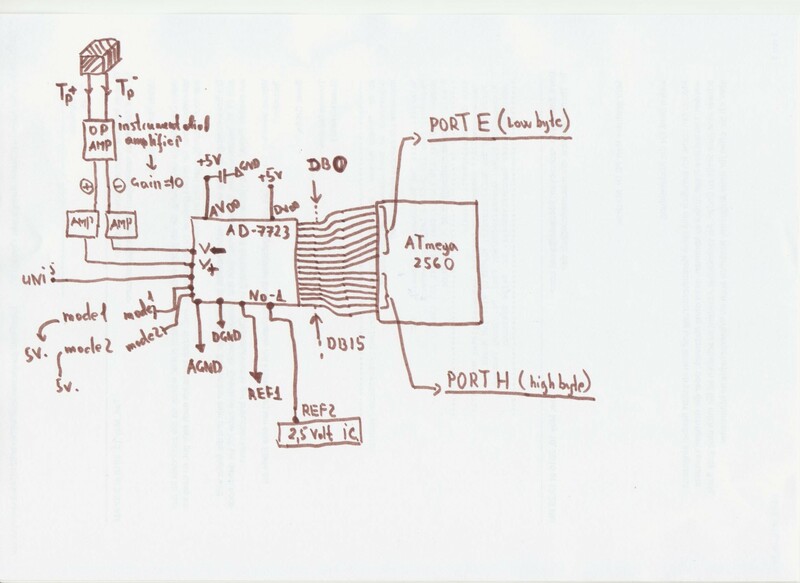 A pin diagram of the Arduino Mega will help. Also, the ADC has a DRDY signal to warn the MCU about new data available. You need to wait for that before reading a value. edit: you should use only 2 AVR ports for the serial interface, each port has 8 pins. I suggest that you connect ADC D0-D7 to PORTA (Arduino Mega pins 22-29 in ascending order) and ADC D8-D15 to PORTC (Arduino Mega pins 37-30 in descending order). If you have no idea what I'm going on about, please say so and I'll try to be more clear. The ATmega 2560 is connected back to circuitry as you proposed. What are next steps? by the way, I even have got a tri-state buffer latch here, tho it is smaller in size, it has just 6 input terminals, so in case we use them, we have to connect all three, to support the 16 bit bus. What do you intend to accomplish adding a very fast $50 external ADC, parallel, to an AVR8 application? Lessee, a 600Hz sine wave has 600 cycles per second, right? How many samples do you intent to take for each cycle? If you answer "10" then any reproduction/analysis will be coarse. If you say "100" then where are you going to put all the sample results? When are you going to find the processor cycles to do anything with it? As mentioned, you don't read/stor a bit at a time. With your described setup you would do it a port at a time. Now, let's consider atomic access for a bit. The datasheet does mention latch/buffer. But given the above speed considerations I'd think a /DRDY monitor would suffice. at this stage, it is highly needed/essential to read data from AD7723. That will show that the analog circuitry functions properly. Something like 16 Bit, 200-500 ksps or lesser resolution would be enough, no need to kick-it at full speed. I'm feeding a sine wave 1.0 KHz to analog circuitry and would be nice to see AD 7723 data in serial monitor, showing the mentioned sine wave without any issues. If its successful at this, then later on, the AVR will be supported by E2PROM arrays to store the data acquired from AD7723. In my understanding the DRDY has to have a dedicated port connection, which has to be monitored with interrupt to signal the AVR to read the 16 bit data port? If you are designing-in a $50 part, there must be a reason besides "must use". Again, re-read what I posted, and tell what you intend to do with these readings. You want to get a 16-bit sample, two bytes, every few microseconds. Assuming you get them into a pair of AVR registers, what are you going to do with them in the remaining microsecond or so? The ADC samples the output of the sensor (aka thermocouple). It is important later-on (in further steps) to sample with max resolution 1.2 MSPS, 16Bit, because the changes the thermocouple registers are very fast in µs time domain, so that nothing is missed. they will be fed into a PID controller. But again, we could dump-down the sampling so that AVR wins some cycles to process data. It would be so brilliant if AVR will present data from ADC into serial at that's more than enough to say that analog circuitry works just fine hehe. How int he name of all that is holy is a 16..20..32MHz AVR going too keep up with 1.2Msps? Set aside the fact that you only have 10..20 cycles per sample to read/process the data where in the name of God are you going to put them in a micro with 1..16K of SRAM. Seems like you may have picked the wrong micro for the job. I don't think you will need the latch, reading the value will take just 2 AVR cycles. So, now you connect DRDY to some other free pin and wait for it to go low with a while loop for example. You will have your 16 bit ADC reading in the ADCval variable, so now you just need to scale it to the actual voltage value. edit: but yeah, the AVR will not have time to process the ADC value in 10-20 cycles. Oh no. I really need/must have to run the setup with AVR. Can I clock the ADC with external clock source to 100 KHz=?, should be possible, and then it becomes like a ATmege328 ADC onboard, which runs at 250KHz=? yes/no. Would this be an option?= okay, if not ATmega2560, what about Arduino Due? it runs at 84 MHz. Arduino Due is not an AVR, it's an ARM. What is the MCU supposed to do with the value, anyway? Send it trough serial? It will take a while to transmit the value even at maximum baud rate, although this is done by a peripheral so it doesn't take a lot of CPU time. Why, in the world, are you sampling a thermocouple at speeds like that. Thermocouples are NOT noted for high speed operation! If you add a thermocouple interface IC with cold-junction correction, then you are probably down to a bandwidth of a few hundred Hertz! Are you blasting it with a short-pulse laser or something? But it takes the ADC a minimum of 13 clock cycles to perform 1 conversion, so actually you should be rather happy if you do 20K conversions per second. Something similar. Thermocouples, if they are small enough one can easily measure high speed transitions etc. in materials, for example. What transitions are happening in polymers, are they endothermic or exothermic. All sorts of good stuff. pinMode(ADC_clock_gen_port, OUTPUT); // clock signal output via PWM. I am not sure about CLKIN generation with ATmega2560 port No2, with analogWrite() function, any better ideas ? as mentioned by " meslomp " above to setup decent clock cycle at about 20K? It looks like with this program in serial is nothing but a single "0" in a row. -50K is 50 below absolute zero with K meaning Kelvin. Somehow i think you mean C for Celsius. Two very different men. Not sure how data_ready_port is going to work for you. I think you missed a digitalRead call. This will be always false. You need to read the pin and wait until it goes to zero. I've used Arduino stuff in the wait loop, but this is just for clarity. You can't use digitalRead in performance critical applications, you need to learn how to access the ports directly. Can we see your schematic? I don't understand your code at all. What are the MODE0 and MODE1 bits on pins 7/8 set to? If you are using in parallel (MODE0:1 not 00) then you seem to be ignoring the state of DRDY ?? BTW why is the function that apparently reads the ADC called initAD7723() - very misleading! - "Timer-1" is used for the clock generation of the "AD-7723, CTC mode / 500 KHz"
- "XTAL_OFF" is tied HIGH. - for everything else please see the schematics. After all I considered to use Teensy 3.6 which I have here, but then it looks like that it does not have 5 Volt tolerant GPIO, so now the ATmega2560 is only chance. *  generation. It is running in CTC mode with output on PB5 port/OC1A. *  The OC1A/PB5 toggles each time through. Which generates 500 KHz clock signal. *  to read the 16-Bit data-bus from the AD-7723 external Analog-Digital-Converter. *  The 16-Bit value is then saved in variable. sorry for this long post, but looks like there is no other way. That wait loop is still confusing you, I see. Fortunately, avr-libc has a ready made macro for this kind of situations. edit: and what about ADC pins RD and CS? The datasheet says they need to be low for reading parallel data. drdy_lock is PB5 which is 0x20. Thus the result of the AND will either be 0 or 0x20, but never 1. Remove the ==1 and the IF will test for 0 or not zero. What will happen if the left amp has a bit higher gain than in your ideal world, and the right one has a slightly lower gain than in you ideal world? Since the negative input will be at GND, the instrumentation amplifier can do all the amplification by itself, it doesn't need a differential step. RD and CS are tied >> LOW<< so that the data interface is always outputting. so this is rewritten with all the comments taken into account. We test if the mentioned "L_AD_7723_N1_DRDY_lock" bit is cleared?, and if it is then code in brackets is executed. this left shift is done for getting rid of padding=? and transform the variable to 8 bit? Also there is an issue with AVR (ATmega 2560), I do not have a TQFP to DIP adapter here in my lab. to melt it down into something usable. But on the other hand I found another brand new AVR which is ATmega644 device and it is in DIP package. So as far as it runs at 16-20 MHz, and has enough pins, it doesn't really matter whether it is ATmega 2560 or ATmega644 right=?, so can I use the ATmega644 instead? this one for me would be much easy to setup, then the TQFP cpu soldering and stuff. In my ideal world ^_^). gain is set via the first OP-amp in signal chain. But I am using a separate high-precision power supply with reference for output for analog circuitry. If that makes sense, although I see some stuff which would like to discuss here. This in not what you want. This code will read ADC data if L_AD_7723_N1_DRDY_lock happens, by mere chance, to be >>HIGH<< when the function is called. First mistake: DRDY is active low. So, you want to read data when it's zero, not one. Second mistake: When you call the data reading function, DRDY can be in any state, you don't know. If it's >>HIGH<<, you can't read data yet. You need to wait until DRDY goes >>LOW<<. Another way is to connect the DRDY pin to an external interrupt of the AVR. Normally, AVRs have 2 types of externally triggered interrupts, the basic one is the "pin change interrupt" that triggers on any change. You don't want this here, you want to interrupt only on falling edges of DRDY. The advanced ones are called "external interrupt" (rather unfortunately, as "pin change" are also external interrupts...) and can be programmed to trigger only on the falling edge. In this case, you write an ISR (interrupt service routine) instead of the get_ADC_data() function. This is a function that is called automatically when the interrupt condition is met, asynchronously from the main program. It will update the ADC data constantly without the main program being aware. This means the "ADC_data" variable would have to be made volatile, and also read atomically. let me try the already discussed option with function call "get_ADC_data()" just to see if everything works, later on, I will write a code to use the hardware interrupts as you mentioned. From datasheet on AVR which is ATmega-644P, it's max clock speed is 20 Mhz, I have here an external crystal which is 22.3 Mhz something....., would it be fine if I use this oscillator or it has to be exactly 20Mhz=? and which capacitor options would be wise to connect with it=? My experiments with random crystals show that it will probably work... the capacitors, probably something in the 6-20 pF range will do. Sometimes the crystal will lock to a sub-harmonic, I have somewhere a 27MHz crystal that tends to lock to 1/3 frequency (9Mhz) when I put it on an AVR. But in your final product, if this is not just for educational purposes, you should use a proper recommended crystal!